RHD has been diagnosed in the feral rabbit population on the Vancouver Island University campus in February 2018, and has spread to the aforementioned areas. Please avoid going anywhere near the affected areas, if possible, and take careful quarantine measures as you care for your own domestic rabbits, to prevent spreading the virus to your own rabbits! 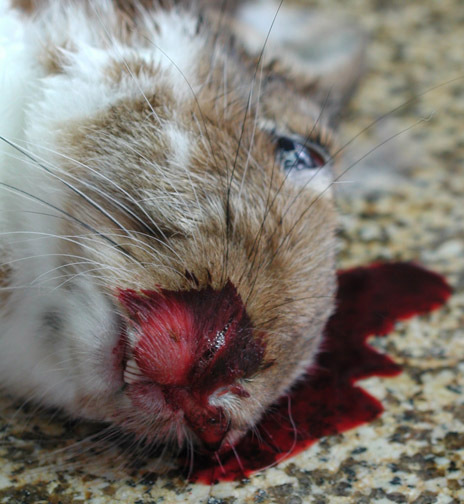 Rabbit Hemorrhagic Disease (RHD, RVHD, VHD, or calicivirus) is a catastrophic disease caused by a virus. I pray it never reaches our barn. Also known as Rabbit Viral Hemorrhagic Disease (RVHD), Viral Hemorrhagic Disease (VHD), Rabbit Calicivirus Disease (RCD), Viral Hemorrhagic Fever, or Viral Necrotizing Hepatitis, RHD is a devastating viral disease that will quickly kill 90% or more of your rabbit herd. The virus incubates over 1-3 days, and then you start seeing dead rabbits for no obvious reason in your rabbitry. In rabbit colonies, you may see 90% sick rabbits and when it’s all over, 100% are dead. The United States is currently free of this virus, however outbreaks have occurred. Aggressive measures have contained and eliminated the threats; this page provides guidelines for breeders and rabbit owners in the western hemisphere. 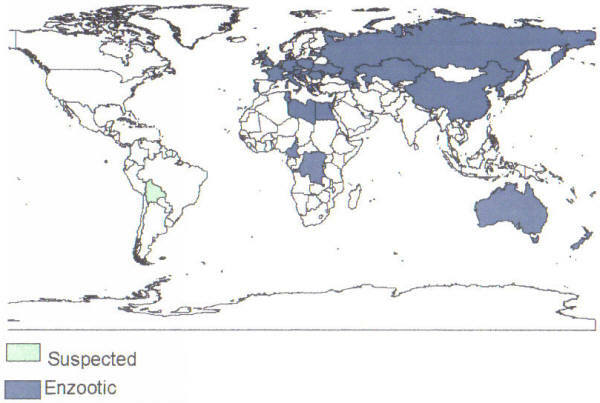 RHD is endemic in the UK, Europe, Australia, and other countries (outlined below). See RHVD for guidelines provided to rabbit owners in countries where the virus is endemic. PERACUTE (very acute and violent): No signs or symptoms - just a dead rabbit very suddenly. And then more dead rabbits, because it is exceedingly contagious. ACUTE: The rabbit goes off its feed, is lethargic and has to strain to breathe. Body temperature soars to 105 - 106F, then begins cooling just before the rabbit dies. SUBACUTE: Bloody nasal discharge, tightness and arching in the back and noisy respiration as the rabbit struggles to breathe. If you see these symptoms, the rabbit may die within 2-3 hours. In some rabbits under 4 months of age, the rabbit may manage to recover and then becomes immune. But despite being immune, such a rabbit is a likely to become an asymptomatic carrier of the virus, as the germs are shed in the urine and excreta for at least a month, and the animal could be a carrier of the virus for much longer. What causes Rabbit Hemorrhagic Disease? The causative agent is a virus known as a calicivirus. The disease was first reported in China in 1984, and has since been reported in most of Europe, parts of Asia, and Mexico (now eradicated). The United States has experienced several isolated outbreaks. See the map, provided by APHIS, which is dated 2000. In Australia in 1995, after a laboratory 'accident' that released the calicivirus into the environment, 10,000,000 feral rabbits died inside of 8 weeks. The only good piece of news about the calicivirus is that humans are not susceptible to it. The virus is sticky. It spreads very easily by direct contact, biting insects, handling infected rabbit meat and by-products, and touching any animate or inanimate object on which the virus sticks, such as food and water crocks and your own clothes and hands, carrying cages, etc. The virus is hardy - it can outlast heat and cold easily, remaining viable in the environment for possibly 2 or more years. It is highly contagious and easily spread. Photo credit: Center for Food Security and Public Health, Iowa State Univ. Follow the link for more necropsy photos. What will a necropsy show? Tracheal hemorrhages, pulmonary edema (water-logging of the lung tissues) and congestion, petechiae (tiny hemorrhages) on the myocardium, kidney, and spleen, and extensive hepatic necrosis (liver gangrene). How can I tell if my rabbits are dying from Rabbit Hemorrhagic Disease? You can make an initial tentative diagnosis based on the rapidly fatal infection and what your naked eye can see on a necropsy exam. But with such a virulent disease, it is vital to call your vet or the USDA so they can arrange for a VHD-specific PCR (Polymerase Chain Reaction) Test - the proving method used to duplicate and then identify the calicivirus definitively - and either confirm or rule out your initial tentative diagnosis. If positive, the authorities will also want to identify where the calicivirus came from and how it got to your herd. Is there anything I can do to treat my rabbits? No, there is no effective treatment. What should I do if I suspect Rabbit Hemorrhagic Disease? If your rabbits start dying for no good reason, you MUST immediately isolate your herd. If necropsies support a diagnosis of RHD, kill any remaining animals in your rabbitry. This is the only way to prevent the spread of the infection. Immediately report the outbreak to the state veterinarian, and to the USDA. (I would probably also communicate with the vets in my area to give them a heads-up.) Double-bag and freeze some carcasses for disease confirmation. Careful sanitation and disinfection are imperative to halting or limiting the spread of Rabbit Hemorrhagic Disease, as is the maintenance of a closed herd. Disinfect everything that has come into contact with your rabbits. In some areas of the world where the disease is endemic in native rabbit populations, killed virus vaccines can provide some modicum of protection. It is believed that the cottontails native to the New World are NOT susceptible to RHD, however domestic rabbits are of the same genus and species as rabbits native to Europe, which are susceptible, and which carry the infection. The Rabbit Industry Council has prepared an excellent handout on RHD in PDF form. Get the Rabbit Hemorrhagic Disease Info Flyer here. An isolated outbreak of Rabbit Hemorrhagic Disease occurred in Pine County, Minnesota, in April, 2010. This was the last known outbreak in the United States. It was fully contained. 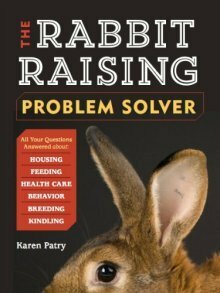 If you are an owner of one or more rabbits and/or you go to rabbit shows, hear is what to do in the case of another outbreak in the USA, and especially one close to where you live. In the case of nearby RVHD, should you panic? No. While frightening in its tenacity and ease of transmission, this disease can be managed and limited in spread by common precautions. It should never be treated lightly or disregarded. We STRONGLY encourage those in [an area of active outbreak and surrounding areas] to think carefully about any unexplained deaths in their herds and to take the appropriate steps for accurate diagnosis should symptoms and signs indicate any possibility of RVHD. If you have any doubts, contact your State Veterinarian for assistance--or contact the Rabbit Industry Council at 530-534-7390 or RIC@cncnet.com. We also STRONGLY encourage all shows and exhibitors to use an appropriate disinfectant [see RHD Info Flyer link above] on all coops, carpets, and equipment. If you are uncertain of your herd health status, please stay home until you get it straightened out.